The success of conventional lubricating oils is predicated upon maintaining a high film strength oil barrier between two surfaces moving relative to each other. Resistance to the movement of these surfaces is defined as friction, which can be either sliding or rolling, or which can be caused by the shearing action of a lubricant attempting to separate the two surfaces. Hydrodynamic, hydrostatic, and boundary lubrication typically occur in some combination in virtually all mechanisms which require lubrication, and most commercial lubricants are reasonably capable of doing the job for which they are intended. 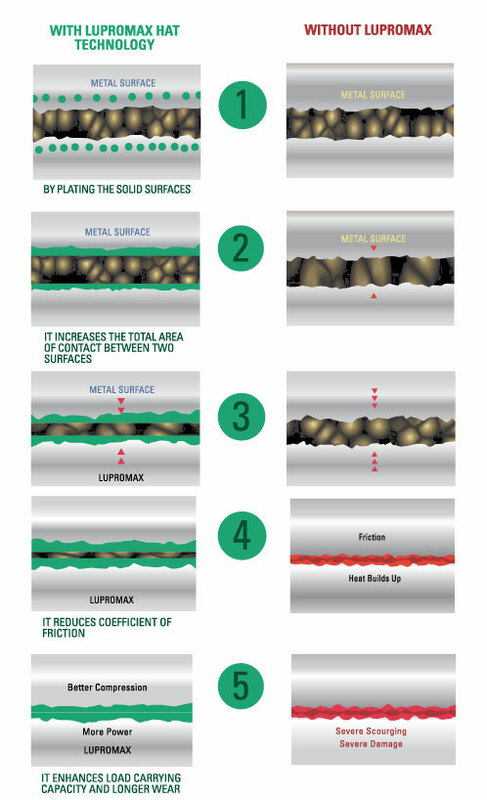 Lupromax is a proprietary lubricant which takes normal lubrication a step further, in that it not only has a superior film strength but also appears to impregnate the steel itself, metallurgically, at the friction surfaces. The majority of lubricants are either mineral (paraffin, napthene, asphalt), synthetic (esters, polymers), solids (graphite, molybdenum disulfide, Teflon), or greases (oils with various organic or inorganic thickeners). Several additives are available for these products which serve as corrosion inhibitors, rust inhibitors, etc. Modern engine oils, for example, usually contain 8 - 10 different additives, accounting for 10 - 20% of the volume in a container of oil, the balance being refined petroleum or synthetic oil. Several products are available with solid particle additives (graphite, moly, Teflon) in an effort to add extreme pressure capability to the lubricant. Lupromax lubricants contain only pure petroleum and petroleum additives, and perform without the negatives associated with solid particle additives. Lupromax blends easily with other lubricants, and is most useful at a 4-6% mix.